Hi Talkers. Annie is harvested and put to reveg. If anyone has any reveg advice i would be happy to hear it. I currently have about 25% success rate for reveg. Hopefully I don't loose this strain. Very interesting read man! Praying you get the seeds!! Thanks Kudos. I suspect that I failed on this attempt. Hopefully with a reveg and some fresh cuttings I can start over. Reveg is not looking great. Has that "I am dying look"
Been spraying her twice a day with a very light veg foliar. Just about 3 drops of veg in 1 liter to get the water to 6.4 PH. Lights are 21 on 3 off. Temps are too high at 29c. I should really fix the temp issue. Should be easy enough but I had a long week and dont feel like doing more work. Yikes, looks like she is a bit shocked. My revegs are a bit hit and miss, but have had luck with a Big Nugs Fast and am having some luck with the Amnesia Fast. 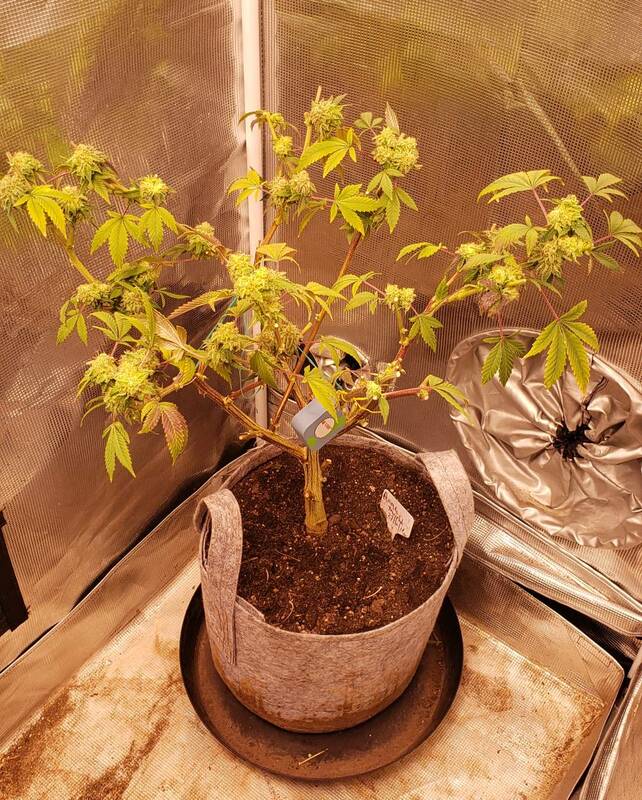 No foliar spray, 24/0 light/dark hours in LED, fed water only till new leaves got big then started with grow A+B. If that was my plant I would NOT do any more pruning, just let her do what she wants and take it a day at a time. If a leaf wants to come off, I would let it drop and pick it up rather than cutting or plucking it off. May be a very little amount of seaweed when watering, nothing more. Fingers crossed CityD!! Thanks for the input Val. She is sharing the tent with my current veg planta so I figured a few hour of dark would not hurt. Everything i have read says to feed N so I have been mixing full veg dose into the water. I will switch to plain water for now. I dont have any seaweed. I could brew a kelp meal tea. I have not been doing any pruning. Just letting her be as you say. For me this will be tragic if she does not veg. I held this pheno for many years and then got stupid at the end. How many days into reveg are you? I just watered into soil and let her be. I fed N too, but only after she was obviously back online. 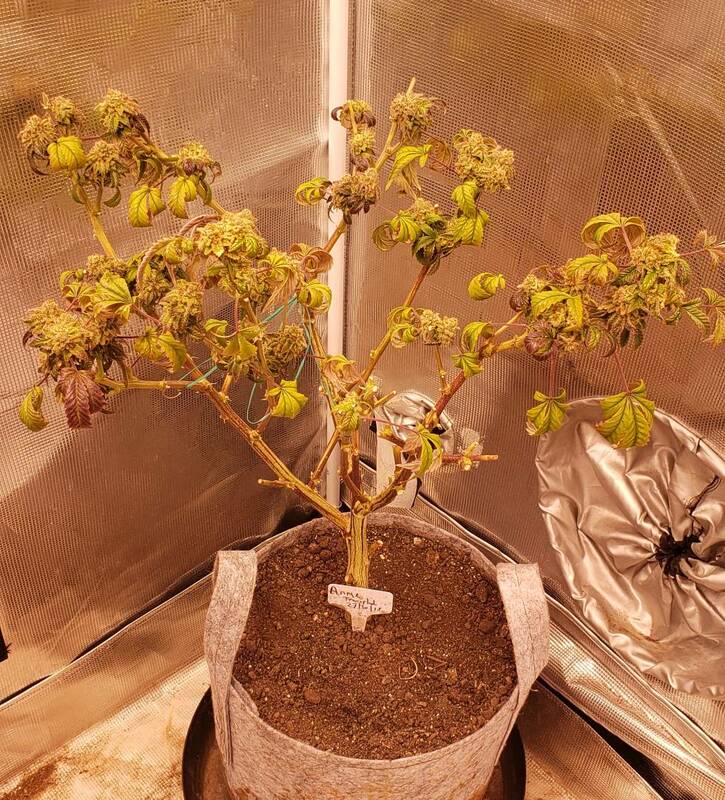 Personally am not a foliar spray kind of person because the water beads under lights can burn the leaves, so it all depends on your set up. The water on leaves thing is a whole other issue and clearly people's opinions differ. You just got me thinking of a science project I did in school. I had to propagate African Violets from a square cut from a leaf, using agar dishes, with auxins and gibberelic acid and stuff like that. I killed them because I fussed over them too much. But now I am wondering how would things go if that was done on cannabis...? Fingers crossed she pulls through. I have been spraying my all my plants multiple times a day since the day I started growing. 6 years about. I never dim or pull back the lights. I have never had leaf burn. I have done this with CFL, HPS and CMD. Plain water, water with a bit of Veg and water with Epsom. When they are young I try to spray 10 times a day to keep humidity up. I truly believe that water droplets amplifying light and burning is a myth. By now it should have happened at least once. I even foliar feed plain water for first 4 weeks of flower at least once a day. Most of the year I have low humidity that i am battling. It's only been 7 days. She has to fully die before I give up. That is interesting to know. I have ALWAYS had that problem with non-canna plants outdoors, so I have almost a phobia. But if different rules apply indoors, hey, that could very well be a game changer!! Going by my Amnesia Fast, new growths should be showing any time now. Keep the faith brother!! I just keep thinking about this. I used to live in the suburbs. My outdoor grows were tomatoes, cucumbers, peppers. I was a pretty decent suburban farmer. Over 2 meter high tomatoes with amazing yields. In the morning before I left for work I would spray them down with the hose heavily. When I got home I would do the same. Some days it was 33c + and to combat the heat I would spray them a third time. Or, every few hours on weekends. Never had the leaf burn issue. Maybe the city smog filters the sun? Hi Talkers. Today is an amazing day. 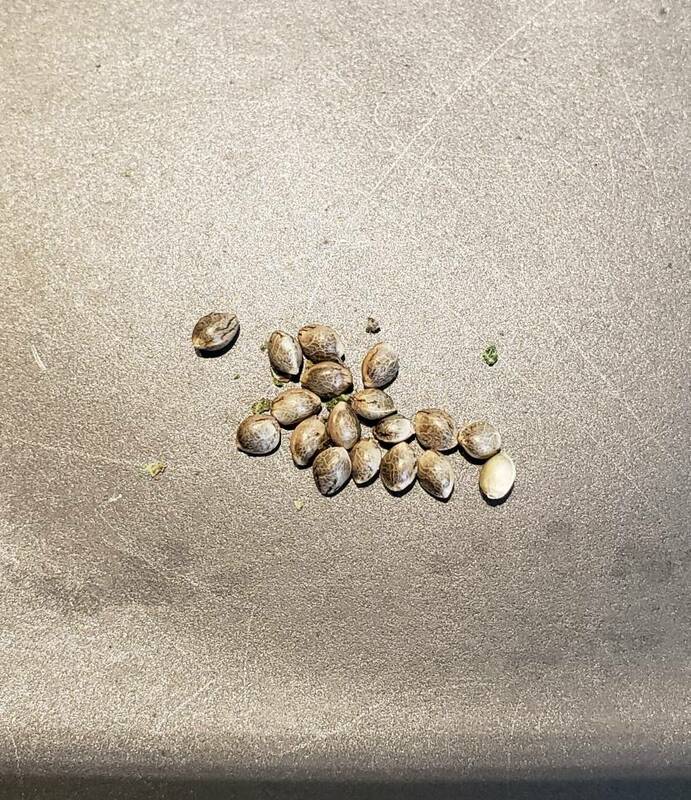 So far I have found 18 seeds in the Annie buds. They are deep inside the rock hard nugs. I need to pick 1 plant to bin so that I can grow two of these seeds and use the reversal spray to try again. At least I did not loose the strain! What a relief. Nice one dude. Got some in the end! Epic. Thanks mate. I am beyond thrilled. Hopefully next try give hundreds and then I can share. My persistence.... lol... look who's talking! Nobody does it like Gaz!